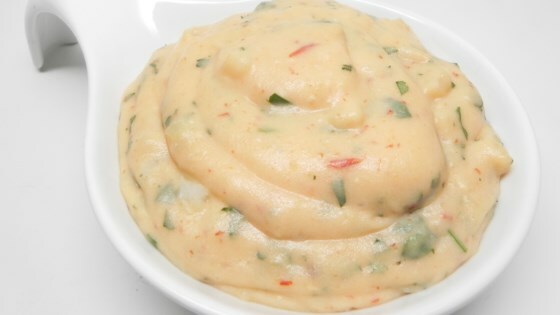 "Garlicky mashed potatoes with a delicious spicy kick of chipotle!" Bring water to a boil in a medium saucepan. Add potatoes and cook over medium heat, stirring once in a while, until easily pierced with a fork, 20 to 30 minutes. Drain. Place chipotle pepper and garlic in a food processor; process until minced. Add potatoes and process until mostly smooth. Add milk, cilantro, butter, and salt. Mix until combined but a few lumps remain. The flavor combo was excellent. I did have trouble with the consistency though. They were gluey. I will make these again but will hand mash next time instead. I found I didn’t need to use the milk in this recipe as it would have been too runny.